A committee of the National Academies of Sciences, Engineering, and Medicine will be holding their second public meeting today, Wednesday, March 27, 2019, beginning at 9:30 a.m. You can register to attend remotely by signing up here. As described in this press release, several veterans and others affected by quinism have traveled to Washington, DC in the hopes of providing three minutes of testimony to the committee. For those who will be joining the meeting online, please note that the committee members will likely not read any comments posted to the online discussion forum. As described in the meeting agenda, 25 minutes has been allocated to take public comments at the end of the meeting, beginning at approximately 11:25 a.m., however, we would ask participants to be mindful that any such comments may compete for very limited time against those who have traveled to Washington, DC or who have prepared statements in advance, as described in our previous newsletter. You can learn more about the committee’s planned 18-month study in recent press coverage from WUSA9 and Military.com. Canadian law firms Howie Sacks & Henry and Waddell Phillips held their latest in-person town hall meeting in front of a packed house this past Sunday in Ottawa, Ontario, to discuss the upcoming mefloquine mass tort lawsuits against the Canadian Government. 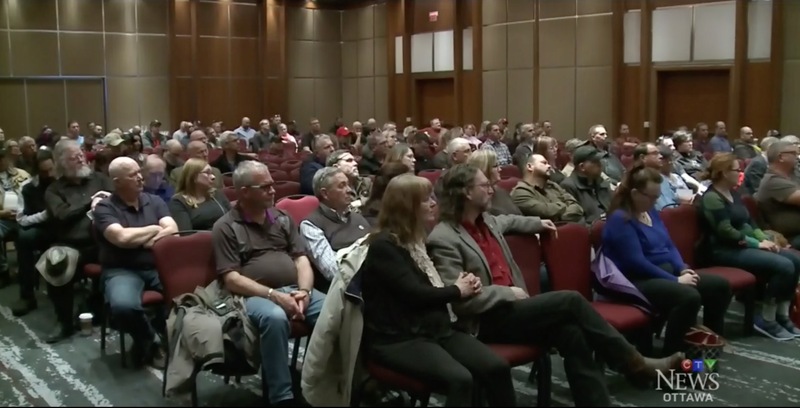 The meeting received significant media coverage, including in a local story on the Ottawa CTV affiliate, and on the national CTV news broadcast. Executive director Dr. Nevin has a new letter published in the British Journal of Psychiatry, critical of PTSD researchers for failing to measure and control for the confounding effects of symptomatic mefloquine exposure in their studies. Dr. Nevin also has a chapter on quinism in the new book Veteran Psychiatry in the U.S., edited by board member Dr. Elspeth Cameron Ritchie. Hurry! There are just over four weeks until our 2019 Annual Meeting. Now is the time to register and make your travel plans to White River Junction, Vermont. Our Annual Meeting is your opportunity to meet with others affected by quinism, hear from experts in the field, and stay informed of the latest developments. We are looking forward to welcoming you. Register today!